A pork loin roast is a nice change from beef, and adding barbecue sauce gives it a spicy vibe. 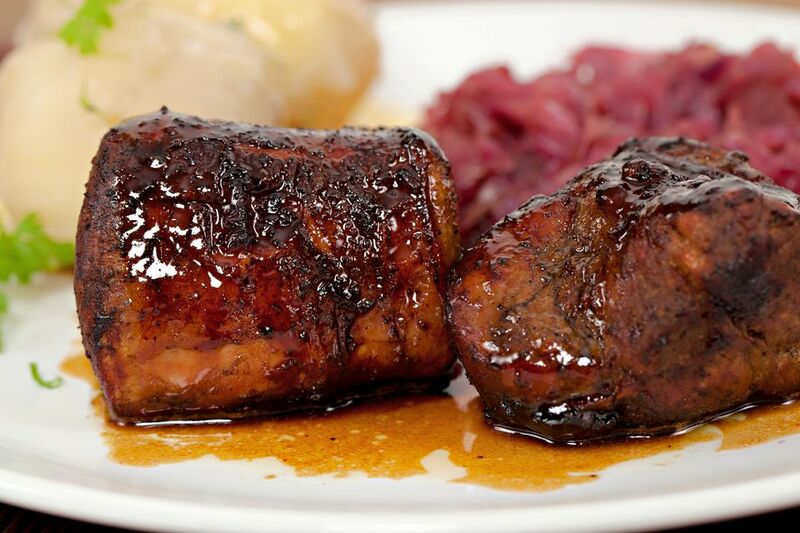 This barbecued pork loin is roasted and basted with a hot and spicy homemade barbecue sauce. Add more or less Tabasco, depending on the heat level you like. Place the pork loin roast in a roasting pan. In a medium saucepan over medium-high heat, combine the sugar, paprika, salt, pepper, garlic powder, onion powder, Worcestershire sauce, pepper sauce, lemon juice, vinegar, and water. Spoon the sauce over the pork loin. Roast the pork in the preheated oven for about 2 to 2 1/2 hours, or to an internal temperature of at least 145 F on a meat thermometer. Baste the roast pork frequently with the sauce throughout the cooking time. Roast boneless pork loin — 3 to 5 pounds — for about 20 to 25 minutes per pound. Bone-in pork sirloin — 4 to 5 pounds -- takes about 25 to 40 minutes per pound. The minimum safe temperature for pork is 145 F. Use a reliable instant-read thermometer inserted into the thickest part of the roast, not touching bone or gristle.